On a recent visit to Florida, my family decided to go out and walk around. We were enjoying the walk, as the hotel was by a lake and you could see the fireworks from three parks, the evening could not have been going any better. Then we see something in the dark, moving about. To little to be a gator, maybe a raccoon. So we went to investigate. As we approached the creature, it seemed unaware of our presence. 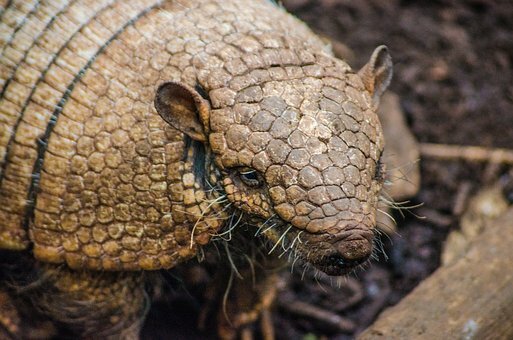 We slowly crept closer and closer, till we recognized it to be an armadillo. She was peacefully wondering through the shadow, beside the lake, enjoying her day walk too. Still no anxiety or concern from our forest friend. The father of my children called them over with him, to watch the little woman in her natural habitat. The obedient offspring did as they were told and joined the stalking. They followed her to what seemed to be a burrow in the corner of a Cypress Tree. She became agitated and didn’t enter. Instead she turned and took notice of our group, but was not intimidated and to examine us. Crazy people do things which are not in their nature when on holiday in Florida, so my husband decided to show the children how armadillo’s are like rolly polly bugs, assuring us it would roll up in a ball when antagonized. He picked up a stick and hit the brush . She ignored him. He threw a stone in her direction, she shrugged him off. To prove his point to his kids, he ran at the armadillo, expecting her to roll up and be still. This armadillo ran at my husband so fast, he lost his flip flops trying to get away. Well, here came the armadillo, following my husband, not us, hissing and spitting and making unnatural noises I have never heard the likes of since. When we finally made our way back to our condo (we forgo the elevator, no time if the armadillo was still on our path), my husband made the profound observation,”Armadillo’s are not as passive animals as I was told”.